Spanish star Rafael Nadal slipped to a disappointing 6-4 4-6 6-3 6-4 second-round defeat to Gilles Muller. The French Open champion has taken the game by storm this season, but his unfamiliarity with grass showed up as Muller claimed a notable victory. The Luxembourg player, ranked 69 in the world, tore into the fourth seed from the start to take the opening set. Nadal took the second to level but Muller raised his game and his assured display gave Nadal no way back. The 19-year-old Nadal said he would go away and work on his grass-court game. "I need to improve my serve and my volley and also my confidence on grass," he said. "Sometimes I am a bit nervous when I serve because I know if I don't win the game then I could lose the set. "I have to face up to this and must play more and train more on grass." Muller admitted he was relieved his third meeting with his fellow left-hander was on grass. The 22-year-old, who had lost their previous encounters on clay and hardcourt, said: "It is easier to play him on grass than on clay, that's for sure. He's the man on clay this season. "But on grass it is different. I can use my serve and volley and that will always be tough for clay-court players. 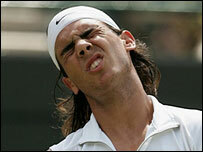 Maybe Nadal will never win Wimbledon."